Playoff matchup will have one of the best offenses line up against one of the best defences. Alex Smith expects to see a lot of pressure from the Saints defense this week. Drew Brees piled up points, yards and accolades in a record-setting season for the New Orleans Saints. Much of the time, Alex Smith did just enough to get the San Francisco 49ers back in the playoffs for the first time in nine years while a dominant defense and kicking game did the rest. Does that old notion that defense wins championships still hold up these days? Brees and the Saints (14-3) come to sold-out Candlestick Park on Saturday afternoon riding a nine-game winning streak after gaining 600 yards in each of their last two games, including a playoff-record 626 yards in last Saturday night’s 45-28 win over the Lions. Brees threw for 466 yards and completed 33 of 43 passes. Since the merger in 1970, a team had gained 600 yards in a game only 11 times in the regular season or playoffs before the Saints did it the past two weeks. The San Francisco defense knows it will have to keep Brees off the field and pressure him at every chance to slow down these Saints. The fact that Lee is such an important figure for the 49ers shows just how different these teams are. The Saints didn’t punt once in their playoff opener. 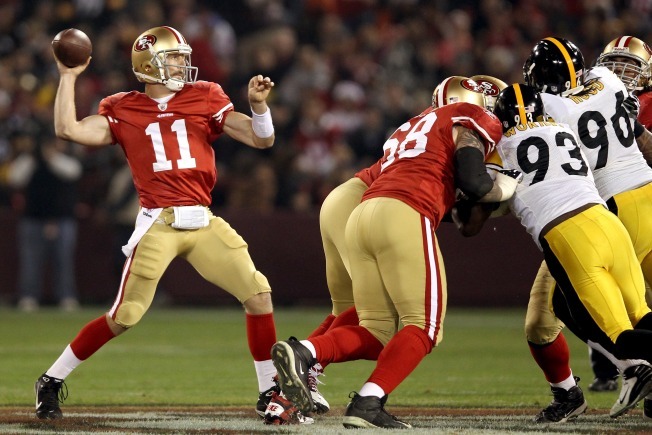 San Francisco (13-3) also relied on David Akers’ single-season NFL record of 44 field goals to return to the playoffs under first-year coach Jim Harbaugh. The 49ers stunned the New York Giants 39-38 at home in the NFC wild-card game back in January 2003. There have been several noteworthy playoff games featuring teams with opposing styles. In the NFC championship game after the 1999 season, St. Louis’ “The Greatest Show on Turf” group of Kurt Warner, Isaac Bruce and Marshall Faulk held on for an 11-6 victory over the defensive-minded Buccaneers. In the 1991 Bills-Giants Super Bowl, New York’s talented defense held off Jim Kelly and the Bills’ “K-Gun” offense for a 20-19 win. More recently, a Giants defense led by Michael Strahan pulled off a 17-14 victory over the undefeated Patriots’ Tom Brady and Co. to win the 2008 Super Bowl. San Francisco’s dominant D has no flashy nickname, just a balanced attack featuring All-Pro defensive tackle Justin Smith, rookie Aldon Smith and talented linebackers Patrick Willis and NaVorro Bowman. And, in the secondary, Carlos Rogers and safety Dashon Goldson have six interceptions apiece. The Saints scored three rushing touchdowns against the Lions, two by Darren Sproles and another from Pierre Thomas. That’s as many as San Francisco gave up during the season, all in the last two games. New Orleans is three-point favorites and can already envision that premier matchup with defending Super Bowl champion Green Bay in the NFC championship game next weekend. Yet Saints coach Sean Payton insists his team found out the hard way last year and doesn’t want to fall in another upset after losing the wild-card game to Seattle. The 49ers plan to stick with what got them this far. They should be fresh and healthy after a week off as the NFC’s No. 2 seed. The Saints chased them late in the year hoping to steal the second spot. One thing these Niners don’t do is make many mistakes. They had 38 takeaways to only 10 turnovers for a plus-28 turnover differential, which matched the 2010 Patriots for the second-best mark in NFL history since 1941. Alex Smith, the 27-year-old 2005 No. 1 overall pick, took care of the ball and threw for 3,150 yards and 17 touchdowns - hardly Brees-like numbers. San Francisco turned things around at last with Coach of the Year favorite Harbaugh running the show and doing things his way. Running back Frank Gore gets it. “What got us here. I think that’s what it’s going to take,” Gore said. Way back at the start of this journey, the Niners took a 24-3 thumping against New Orleans in the Superdome in the teams’ August exhibition opener. The Saints blitzed all day and finished with six sacks. It’s still plenty fresh for the 49ers. While the 49ers feature only eight players with playoff experience to 39 for the Saints before last weekend, they are loose and unfazed.